AS220, RIPTA, and Nail Communications have come together to produce “MOVING” – a fully functioning RIPTA bus that will serve as a mobile art gallery. Wrapped inside and out with black and white photographs, taken by students in the AS220 Youth program, of Rhode Islanders who use Kennedy Plaza in a myriad of different ways, the bus gallery will have a “non-moving” opening in Kennedy Plaza on September 29th from 4-9pm and will then hit the roads for the duration of the Fall, changing routes on a regular basis to bring the art project to the most people possible. The project is part of FirstWorks Festival: On the Plaza in 2012. 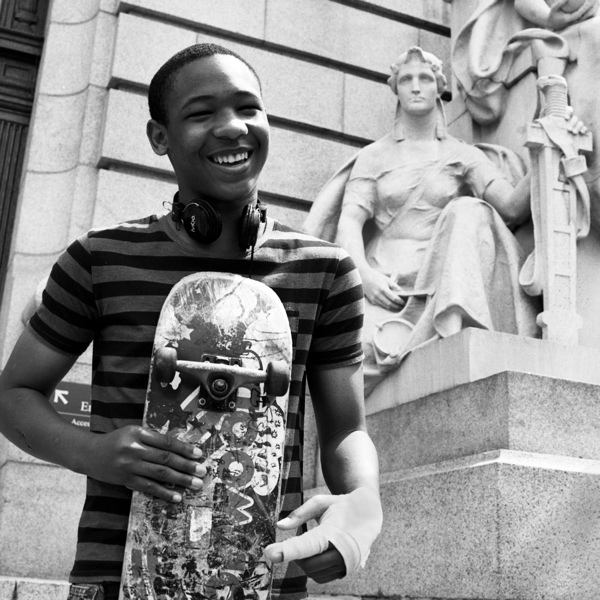 For the past three years, the AS220 Youth photography program called “Photo Mem” has spent six weeks each summer producing the Kennedy Plaza Portrait Project. The goal is to capture a cross section of Rhode Island citizens by photographing Black & White portraits and recording interviews of a small cross section of the tens of thousands of people who use Kennedy Plaza every day. The project also gives our Youth the opportunity to enhance their social skills (approaching people, communicating to them about the project, interviewing them), photography skills (taking a good photo, developing it) and design skills (hands-on experience working with Nail Communications on designing the bus), that they otherwise would not be able to take advantage of. In addition to the bus, photos from years past will also be on display at the City Hall Gallery starting on September 29th.